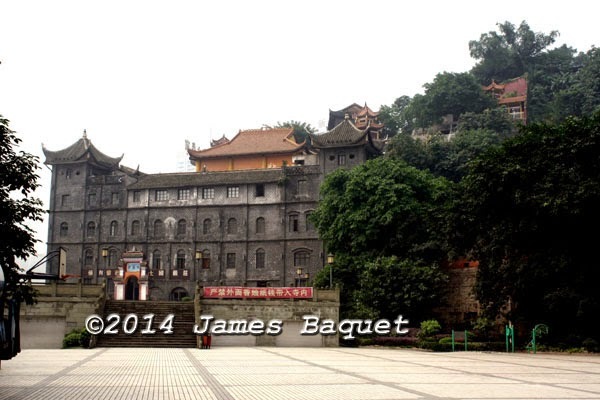 a religious establishment; note the buildings marching up one of Chongqing's trademark hills. 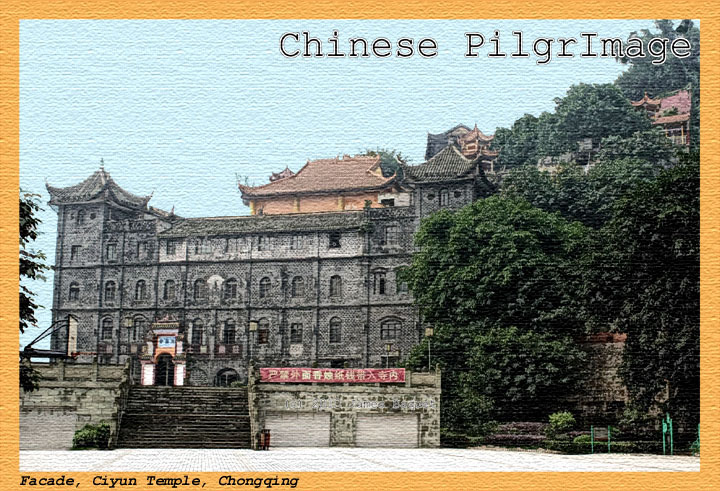 Upon leaving Luohan Temple, I had expected to travel back along the peninsula, cross the Yangtze by bridge, and return up the east side of the river to Ciyun Temple, my next goal. Imagine my surprise when I learned that there was a ropeway across the river, starting near my first temple and ending near my second! For some reason, it doesn't appear on Google Maps. (The stations are there, named in Chinese--if you know where to look. But the ropeway is not shown.) Built in 1987, it is 1116 meters in length--over a kilometer--and gives an excellent view of the river and its environs (when the air is clear, that is). Alighting only 1.5 kilometers from Ciyun Temple, I took a pleasant walk up the river bank to the turnoff. Ciyun Temple was founded in the Tang Dynasty, and rebuilt early in the 20th century. 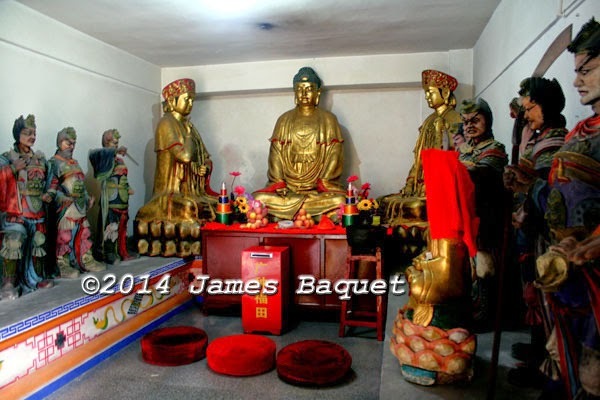 It claims to be the only Buddhist temple in China that houses both monks and nuns (in separate quarters, of course). There is an historical reason for this: There used to be a port on the nearby river where monastics of both genders would land on pilgrimage. The kindly abbot at Ciyun Temple welcomed all, and a tradition was begun. This kindness is fitting: until the reconstruction a century ago, the temple was named Guanyin Temple, after the Bodhisattva of Compassion, and its current name, Ciyun, means "Cloud of Compassion." A cave featuring Guanyin still rests at the center of the complex. The temple's location at the base of Lion Hill has led to a unique configuration. The front halls are multi-story, and the rear halls march up the hill behind. The overall impression is one of verticality. Not one of the flashier temples, Ciyun is a quiet place, with a few collections of exquisite statues, including the twelve heavenly generals, one assigned to each year in the Chinese zodiac. 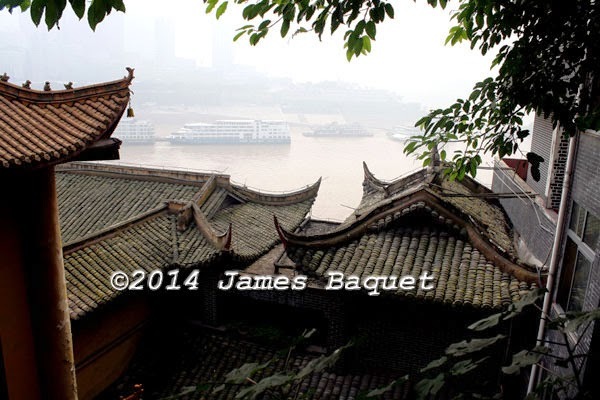 It's a nice respite after the crush of central Chongqing and the area around Luohan Temple. 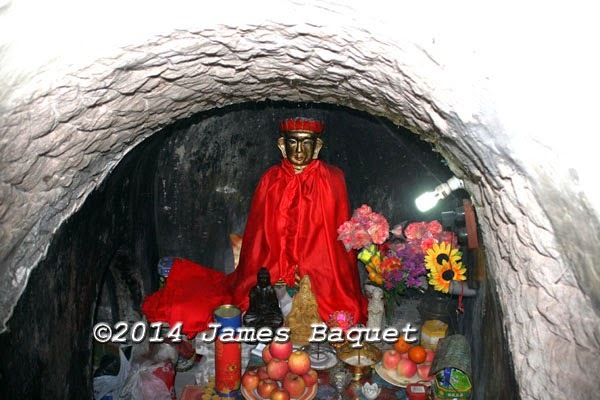 This cave features statues of Guanyin. The twelve heavenly generals face a Buddha. There are 14 pictures related to this temple (some of them identical to these, but with different captions) in a FaceBook album starting here (available to all, even without a FaceBook account).